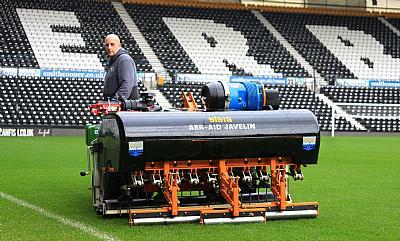 The Javelin Aer-Aid 1500 from SISIS not only aerates with a vertical action, but also injects air into the root zone at a fast working rate, creating thousands of fissures. The cam trigger mechanism ensures that the air is always expelled at the bottom of the tine penetration, enabling treatment to be targeted precisely and consistently. 10mm diameter ‘tipped’ tines are spaced at 75mm (3ins) with depth of penetration, infinitely variable, to a maximum of 127mm (5ins). These air injection tines are specially designed to use the maximum air available from the compressor and produces clean, fresh, air at a constant rate of 88 litres per minute, while surface disturbance is kept to a minimum. “We use the Javelin Aer-Aid every time we get a decent break in between games and that is all about trying to keep the pitch regulated in terms of how hard and how soft it is. 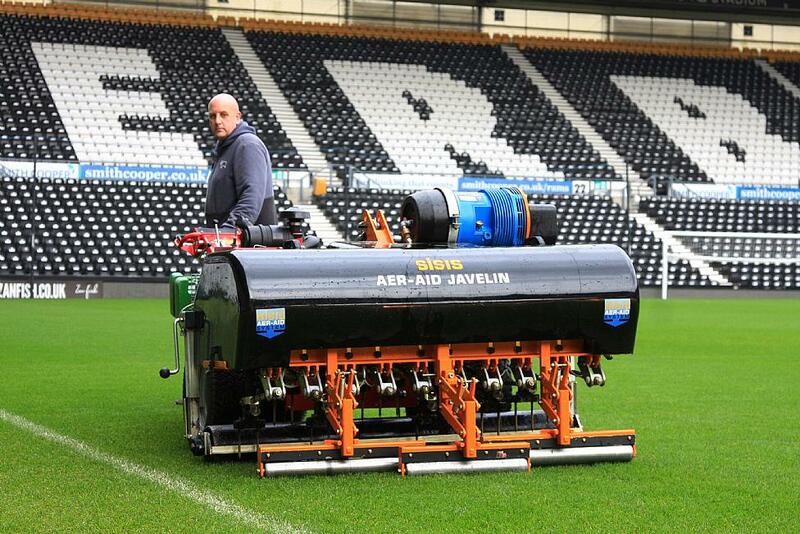 We can aerate the pitch in under three hours and it can be played on immediately afterwards. “The option of the air injection has proved to be invaluable to us. In a stadium environment we don’t get a lot of natural air movement or sunlight so the water movement isn’t particularly good. Being able to inject the air helps prevent any problems like black layer and it also great for helping to reduce the compaction from using the heavier machinery on the pitch. Alternative tines for other operations, such as hollow coring before top dressing, are available to make this SISIS a truly versatile aerator.